Read news and updates from Karen and the Karen Reed Orchestra. 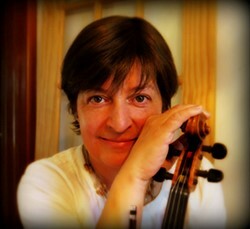 Karen has been teaching fiddle for over 25 years. Her passion for teaching is equal to her passion for fiddling. She offers lessons to students of any age and teaches a variety of fiddle styles. Contact Karen for questions and further information on her events, teaching, and more! Further to Karen’s love of fiddling, her passion extends to the social dynamics that are central to its very essence. This traditional culture brings people together where there is a sense of belonging, community, and family. Her awareness of this social dynamic remains one of Karen’s missions when considering fiddling—that it not lose the place from where it originated nor fail to serve its purpose ~ touching people, speaking into their lives, and echoing the voices of those who passed on this tradition throughout the years. Karen is proud of her Canadian roots and embraces fiddling as a significant part of her heritage. She is now a full time fiddle instructor, performer/entertainer, fiddle competition judge, Director of the Orangeville Fiddle and Step Dance Camp, and is a freelance workshop and camp instructor. Being active in the Canadian ‘sub-culture’ of fiddling is her way of supporting the tradition of fiddling in Canada. It is Karen’s desire that fiddling never lose its soul and all that is authentic to its traditions. Karen currently resides in Kitchener, Ontario.